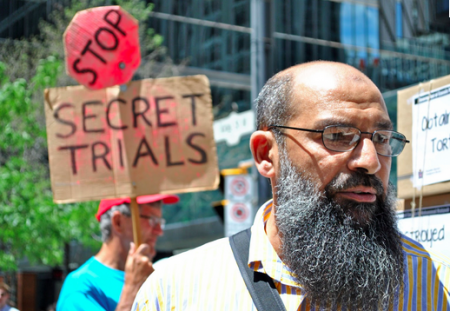 The strict conditions imposed on a Toronto man, Mohammad Mahjoub, due to a security certificate, were removed following a judge's ruling on January 7th, 2013. He will soon be able to remove the GPS tracking device that he has been wearing since he left detention in 2007, use the Internet, ride the subway and and be allowed to change his address without government approval. Mahjoub was seized in June 2000 and held on a security certificate, a controversial mechanism used by the Canadian government to detain and deport non-citizens living in Canada without charging them with any crime. Due to the practice of torture in his native Egypt, Mahjoub was never deported. Instead was placed in indefinite detention until a court ordered him released on house arrest and restrictive conditions. The federal government claims that Mahjoub is a threat to national security and has tried to link him to terrorism, but officials have never charged him with a crime. In recent months some of the evidence against Mahjoub was thrown out of court. "The current conditions of release are no longer appropriate or proportionate to the threat posed by Mr. Mahjoub," wrote Federal Court Justice Blanchard in his ruling. "A new set of conditions is to be prepared." "We received good news last night. The judged removed most of the conditions against me," said Mahjoub, while speaking to a packed house at the Bloor Cinema in Toronto. He showed the crowd the GPS device he wears around his leg. "This will not exist any more within 15 days," he said to loud applause. Mahjoub was speaking after the screening of the movie "Doctors of the Dark Side," a film about the complicity of medical doctors in torture by the US military and the CIA. The event was held by Cinema Politica, an international political documentary screening series. The grassroots support group, the Justice for Mahjoub Network, sponsored the event to draw connection to the fact that some of the evidence against Mahjoub was derived from torture. "This film makes me sick" said Mahjoub speaking about the actions of the US government. "We have to remind ourselves there are some similarities with what happened here in Canada." The federal government claims much of the evidence against Mahjoub would compromise national security if it were disclosed; it has not been seen by him, his lawyers or the public. However, some of the evidence against him has been thrown out of court, for reasons including the theft of confidential records by Ministry of Justice lawyers, and the destruction of wiretap tapes. "Since the last review [of Mahjoub's conditions] there has been a significant change in the evidentiary foundation in support of the Minister's allegations against Mr.Mahjoub," wrote Justice Blanchard in his decision. "The judge is clearly signaling that he no longer buys the government's bogeyman story about Mohammad, " said Victoria Barnett, a member of the Justice for Mahjoub Network who attended the screening. "For over a decade, the story has been that national security would be terribly compromised if Mohammad were to step out of his house without a GPS-tracking bracelet – and of course no one would be safe if he were to use the internet or a cell phone. Well, the judge is saying that is simply not true," said Barnett. Cinema Politica screenings take place regularly on campuses and in communities across Canada for more information click here.